What comes to mind when watching War Horse is the story of Black Beauty, albeit a tougher, grittier version of the children's classic. DreamWorks' picture War Horse is inspired by the Tony award-winning stage adaptation, and the original novel by Michael Morpurgo. 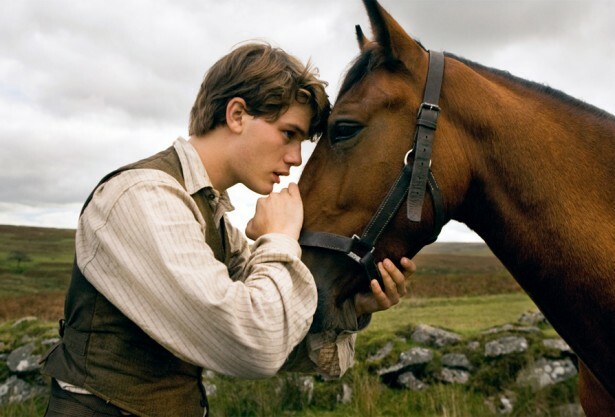 Set in the small town of Devon, England, the film begins with a remarkable friendship that develops between a boy Albert Narracott (Jeremy Irvine) and his horse Joey. They are forced to part because of the war. The film trots on leisurely at first, but picks up considerably as the film traces Joey's tumultuous odyssey during World War 1. Through the eyes of Joey, we encounter different people; from the British calvary, German soldiers, to a French farmer and his granddaughter. The episodic-like transition from owner to owner provides welcome relief to the otherwise weighty narrative. It is as much a tale about the extraordinary bond between man and beast as it is an epic narration about the universal suffering during the Great War, made apparent in the stark image of hundreds of corpses of men and horses strewn about the battlefield. Yet amid the carnage, hope and tenacity still prevails. The climatic scene of a distraught Joey ensnared in barbed wire is quietly chilling. Diffusing the tension somewhat is the droll exchange between the British and German soldier when they help free Joey. It is at once darkly humorous and sobering, speaking volumes about the pointlessness of war. The usual finger-pointing is largely absent in the film. Instead, it focuses on the shared humanity of both sides. Thankfully the film does not wallow in over-sentimentality/ stoop to shameless emotional manipulation. Never mind that Joey's quest to be reunited with his owner seems a tad incredible, but who cares really, when you've got such a lovingly-crafted tale. Once again, director Steven Spielburg has taken the reins to weave a powerfully moving story reminiscent of past films like Saving Private Ryan and Schindler's List. Together with long-time collaborators Janusz Kamiński ( Director of Photography) and John Williams ( Music composer), the master storyteller has created an old-fashioned classic that will resonate with both the old and young. A word of warning, however, the two and a half hour epic might leave some restless. War Horse is easily one of the most gorgeously cinematic films Spielburg has done, no mean feat considering that most of the film was shot without CGI effects. Expect to see sweeping, dramatic landscapes of the Dartmoor countryside. Even the most hardened of cynics will be teary-eyed at the breathtaking and poignant ending scene. Already, War Horse is a contender for the next year's Golden Globe Award for Best Picture of the Year, and has 7 Critics' Choice Award nominations. Notable performances include doggedly stubborn Ted Narracott (Peter Mullan) and his formidable wife Rosie ( Emily Watson). Newcomer Jeremy Irvine's unflagging belief in his 'miracle horse' may strike as absurd, but his youthful optimism is still wonderfully compelling. The appearances of the precocious Emilie ( Celine Buckens) and her stoic, doting grandfather (Niels Arestrup) lend a breath of fresh air to the sombre tale. The Reader's Michael Gross gets a small but memorable role as German soldier Gunther who escapes to protect his brother at the risk of being caught and killed. If anything, the film is about a solemn promise between boy and horse, between men and brothers alike. It's one dark horse, for sure.